Are you interested in learning about other cultures? Is your family warm and welcoming? 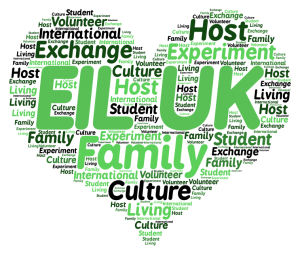 Host families are the beating heart of EIL UK. The homestay underpins the ethos of our organisation; intercultural exchange and experiences create a more peaceful, tolerant and understanding world. 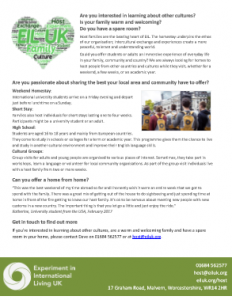 Could you offer students or adults an immersive experience of everyday life in your family, community and country? We are always looking for homes to host people from other countries and cultures while they visit, whether for a weekend, a few weeks, or an academic year. Are you passionate about sharing the best your local area and community have to offer? International university students spend the day with you, or arrive on a Friday evening and leave just before lunchtime on a Sunday. Families also host individuals for short stays lasting one to four weeks. Participants might be a young person or an adult, a university student or a volunteer. Students are aged 16 to 18 years. They come to live with a host family, and study in schools or colleges for a term or academic year. This programme gives students the chance to live and study in different cultural environment, improve their English language skills, and develop independence. 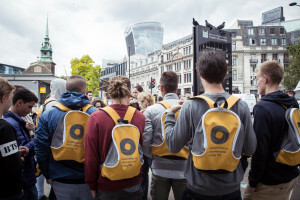 Group visits for adults and young people are organised to various places of interest. They take part in workshops, learn a new language or volunteer for local community organisations. Each student has the opportunity to live with a host family for one to four weeks. Can you offer a home from home? How long do I have to commit to hosting? You can commit to what you’re comfortable with. Many of our families host year after year, but we know that things change so you are welcome to take a break at any time. What do I need to do as a host? People coming over from other cultures want to experience life as part of your family – eating meals together and exploring your local community and its traditions. We encourage host families to make their house rules clear and this is something we can support you with. We give families a contribution toward hosting which depends on the length of the homestay. You will need to show that you have household insurance, to make sure that both you and your visitor are protected in case anything happens. Most policies will already cover you. I live on my own, can I still be a host family? Anyone can be a host family. What matters most is a warm, friendly “home from home”. You could live on your own, be a single parent or have an extended family the size of a football team. I’m not sure about hosting. What else can I do to help EIL UK? Hosting isn’t for everyone, but there are always things you can do to help us. Please drop us an email or call the EIL UK team to find out how you can help. If you would like to know more, or speak to someone about hosting before making a commitment, please contact Mary on 01684 562577 or at host@eiluk.org. We now have an A4 flyer! If you would like to support EIL UK please share it. It would be great if you could let us know where and how you have shared it so we know who to thank. Just click on the picture to the right and you can save and share to your heart’s content. What do you have in your community that you think people might like to see or be involved in? 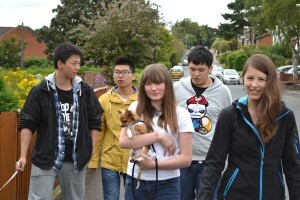 We have international students from across the world. Who would you be most interested in hosting with your family? We will only ever use your e-mail address to send out newsletters and to give you information about other EIL UK activities. We will never pass on your details to any other organisation. We believe that by being together, learning together and living together we can work towards a more tolerant and understanding world.